The Peoples Democratic Party, PDP, has thanked the Chairman of the Presidential Advisory Committee on Corruption, PACAC, Prof. Itse Sagay for indirectly campaigning for its presidential candidate, Atiku Abubakar. 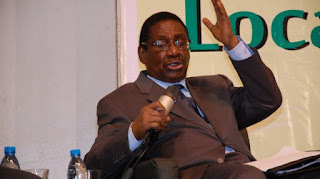 The PDP, in a statement by its National Publicity Secretary, Kola Ologbondiyan, was reacting to a statement by Sagay that Atiku had a lot of baggage but that the Federal Government had no concrete evidence to convict him. However, the party said its presidential candidate had no baggage and remained the best option for the country ahead of next year’s general elections. PDP stated, “If Prof Itse Sagay said the PDP candidate, Atiku Abubakar has a baggage but the government has no concrete evidence to convict him, it means that our candidate has no baggage. As a lawyer and a respected one at that, for you to say that somebody has a baggage, that means you have provable evidence against the person. “If you have no provable evidence against the person, you cannot lay claim to any baggage. Prof Sagay has helped to tell the world that our candidate has no baggage and he is as clean as a whistle. We enjoin and encourage him to continue the campaign in favour of our candidate. “Our candidate has got what Nigerians are looking for today. He has got capacity. He is that candidate that understands Nigeria in such a way that he is acceptable across board. Our candidate has got the experience having worked at the highest level in the country. “He is accepted in the North West; he is at home in the North East; he understands the South West; he knows the North Central; the South South is like his home state; he is loved by people of the South East; he is a true Nigerian who understands the nuances of all our people.